Saturday night we had our first flag football game of the corporate challenge. We lost, but I had a lot of fun. I even managed to get one “tackle.” I can’t throw or catch very well, but I figured I might be okay at chasing people. It was way more of a workout than I was expected and after our 30 minute game our team rolled our sweaty selves in Buffalo Wild Wings for beer – gotta rehydrate! We didn’t make it home until nearly 10pm and I was starving for a real dinner, so I threw together a pesto shrimp pizza using the master recipe from Artisan Bread in Five Minutes a Day. I love how quickly the pizza dough can be used. While the oven was preheated, I flattened the dough, peeled the shrimp, grated the cheese and layered the pizza. After 11 minutes in the oven, I was greeted with real food! So tasty. It was almost 10:30 by this point so I pigged out and then passed out. Glorious. I took a photo, but I was clearly more exhausted than I thought because it is basically a giant, unrecognizable blur. Sunday I spent all day prepping for the upcoming week. I cut veggies, cooked chicken, soaked and cooked beans, made enchilada sauce, did laundry, and got Brent to help vacuum the whole house. I also pre-read some chapters for psych nursing and at the end of all that, I made another shrimp dinner. 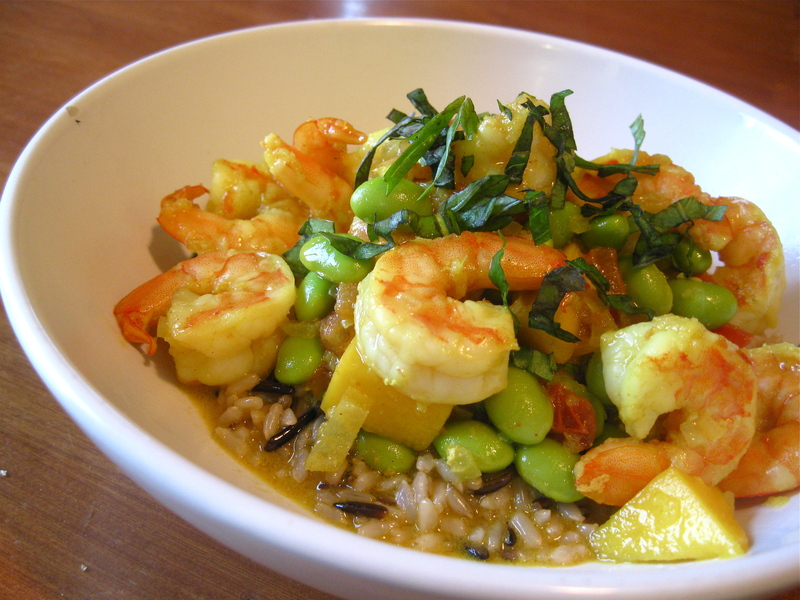 I was planned on making Cilantro Shrimp from Cooking Light, but I had no green onion, and very little cilantro – and I wanted more veg in it. I sautéed 4 cloves of garlic and 2 tablespoons of grated ginger in 1 tablespoon of sesame oil for 30 seconds. Then I threw in 1/2 lb. of peeled and deveined shrimp and cooked for 1 minute. Finally I added 1/2 lb. 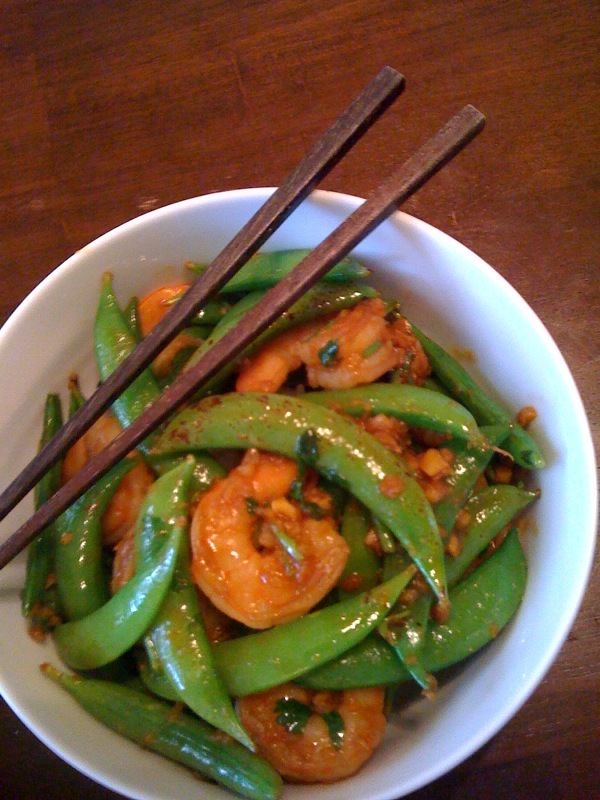 of sugar snap peas, 3 tablespoons low-sodium soy sauce, 2 teaspoons of Sriracha, 2 tablespoons of cilantro and cooked for an additional minute. I served it over short-grain white rice and called it a day. The whole meal took 25 minutes – mostly because of the rice. Posted in Uncategorized and tagged Shrimp. Bookmark the permalink. More good food today. I spent all morning working on case studies for class and 3 hours later I was ready for lunch. Because I’m in a wrap rut (which I have no desire to break out of), I made another one for lunch. Today’s included 1/2 cup white kidney beans mashed with 2T spinach and artichoke hummus (Sabra – delicious, but roasted red pepper is my fave), shredded carrots, sliced cucumbers, 1/4 of an avocado and a handful of spring mix. 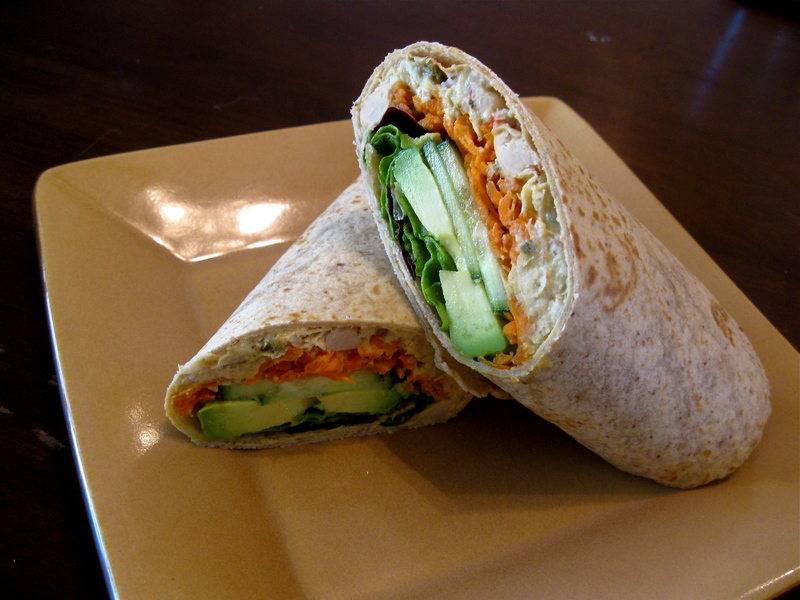 I use the La Tortilla Factory whole wheat, high-fiber wraps. Dinner was this recipe, which I’ve been meaning to make for a while. I love roasted broccoli (even if it does make my house smell like it’s cousin, brussel sprouts) and I loved the pop of lemon in this dish. I tossed the shrimp and broccoli over some Minute Rice brown & wild rice. The article accompanying the recipe also suggests using pressed tofu (which I think sounds really tasty) or cubed chicken in place of the chicken. I will definitely make this again because Brent and I both enjoyed it and it was super quick and easy to prepare. A perfect weeknight meal. 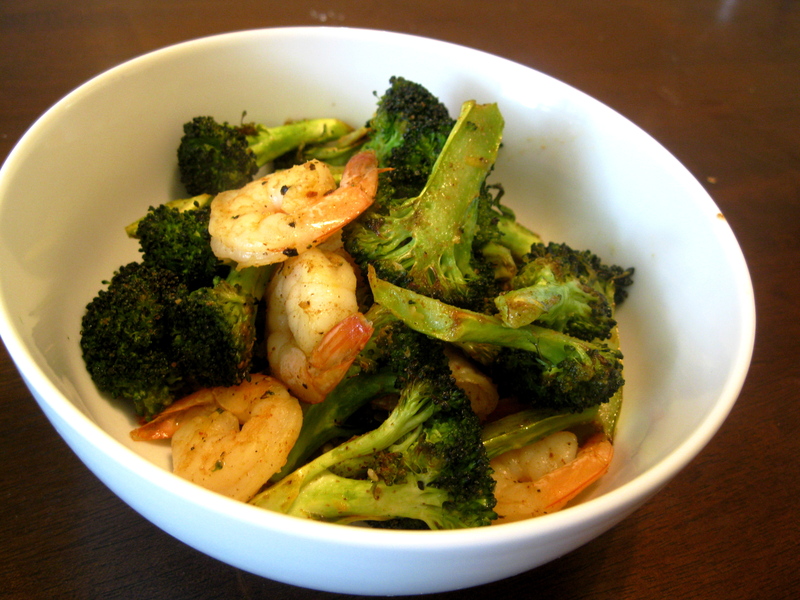 Posted in Uncategorized and tagged Broccoli, Shrimp. Bookmark the permalink. I like shrimp, avocados and tacos. Together, they’re one of my favorite warm weather meals and I make these Ceviche-Style Shrimp Tacos quite frequently in the spring and summer. Another reason I chose to make these tacos is because we have 4lbs of frozen shrimp in our freezer, and it looks like we’ll be moving out of here in 2 weeks!! Obviously I’m trying to use up our freezer and pantry items now so that we’ll have less to move. Plus we will definitely have a lot less room for food storage in our new place so I might as well downsize now. My semester is winding down. I have a rather important comprehensive pediatrics exam at the end of this week that I’m studying like crazy for. I’ll be glad to get that exam over with, but I’m actually pretty sad about my pediatrics clinical ending. I really loved it and as of right now (it’ll probably change next semester), I really think that’s the area I would like to work in when I graduate. 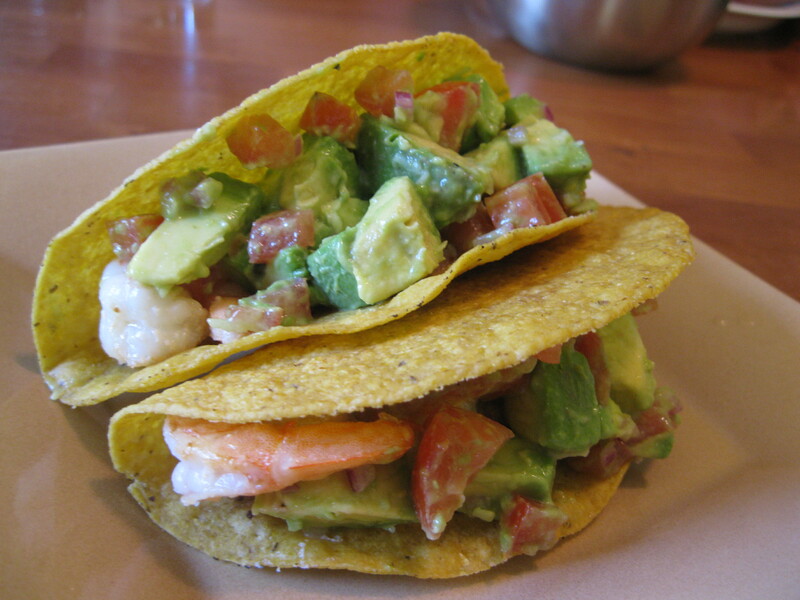 Posted in Uncategorized and tagged avocado, Shrimp, tacos. Bookmark the permalink. Last weekend when we were visiting Brent’s family I demanded Brent’s mom offered me some of their asparagus, which Brent’s dad grows in his “garden.” They live on seven acres and his garden is actually bigger than my backyard, so he’s got quite a bit of good stuff growing in there. Monday night, I used this super fresh, pencil-thin (just how I like it!) asparagus to make a simple shrimp and asparagus pasta with white white sauce. It was tasty and simple, perfect for a weeknight dinner. Meanwhile, heat oil and butter over medium heat in a large pan. Sear shrimp in pan, flipping to cook other side when done. When shrimp have cooked through, remove them from the pan with a slotted spoon. Put the onion and garlic into the pan and saute until softened. Add the wine, and scrape up any stuck on brown bits on the bottom of the pan. Add the asparagus and bring to a boil. Reduce heat and simmer about 5 minutes until sauce has thickened slightly. Add back in shrimp until heated through. 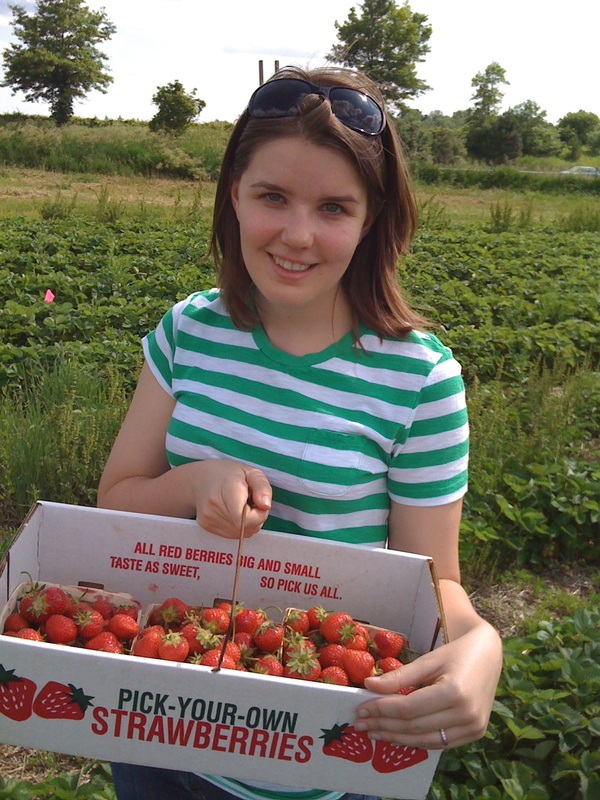 And now for our CSA haul! This week we got a lot of greens! I’m planning a green smoothie tomorrow with the kale or spinach, I think. That basil looks amazing and it might get used in a margherita pizza or some pesto. Any other suggestion? Posted in Uncategorized and tagged CSA, Pasta, Shrimp. Bookmark the permalink. Like I said, I was all psyched up for summer weather when I was planning this week’s menu, so I’ve included some of my favorite warm weather foods this week, like the pasta salad and these tacos. I made these tacos some time last summer and they’ve been a staple ever since. My love of avocado is pretty well documented, so obviously I think these are delicious. I personally prefer a crunchy shell over the tortilla, because I like the contrast of the crunch against the smooth avocado. This meal is super quick to prepare and took me only 15 minutes. It’s supposed to be another rainy, dreary day, but rather than working today, I get to go to an “Administrative Professionals Luncheon” instead. Unfortunately it’s at a fancy steak house, so I’m hoping there’s something for me to eat there. Brent and I try to live fairly eco-friendly. We rarely eat meat. We have energy star appliances. I take reusable canvas bags to the grocery store, and we only buy necessary paper products, like toilet paper, and we normally get the recycled kind. I’m sure there’s more we could be doing though. What are your favorite green habits? So, I have a secret. A deep, dark, slightly embarrassing secret. I have kind of sort of gotten addicted to Rachel Ray. For shame, I know. Not that there’s anything wrong with liking Rachel Ray, but she is a bit too perky for me, and her food isn’t normally stuff I’d make. However, ever since we cancelled cable, I’ve greatly missed watching people make food on the Food Network. Rachel Ray’s afternoon talk show has slightly filled that void for me. I watch it while Gmail chatting with my best friend, or when I’m feeling more motivated — while I’m on the elliptical. Twice recently, she had made a pasta sauce with cherry tomatoes, slowly cooked until they burst, and added wine. Sounds perfect to me, so I sauteed some garlic and onion until very soft, added a pint of grape tomatoes, some salt and pepper, and cooked on low for about 30 minutes. The tomatoes got super soft and squishy. I added about a cup of white wine and cooked until it reduced down. Then I threw in the remains of a bag of shrimp and added some whole wheat spaghetti. I really loved this sauce. I like most sauces with wine. Brent’s response: “Tomatoes have alcohol soluble compounds in them, so they taste better when they’re cooked with wine.” I guess that means he liked it. Off to work, which means Popcorn Fridays! And then a stint at the animal shelter, and then finally our dinner date! It’s shaping up to be a pretty good Friday. I hope it’s fun, because I have a major Microbiology exam hanging over my head the rest of the weekend. Here’s a Friendly Friday PSA — Head over to Jenna’s blog to donate to her Team in Training effort and get her e-cookbook, which has one of my recipes in it! And when you’re done with that, go see Sarah for an awesome Bob’s Red Mill giveaway! Posted in Uncategorized and tagged Pasta, Shrimp. Bookmark the permalink.